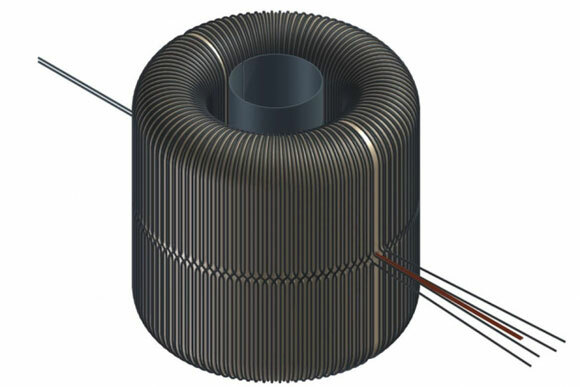 Broadband/Resonant Approach to Cosmic Axion Detection with an Amplifying B-field Ring Apparatus), consists of a series of magnetic coils, wound in the shape of a toroid, or donut, which is then encased in a layer of superconducting metal and kept at temperatures just above absolute zero. The scientists plan to use a highly sensitive magnetometer, placed inside the donut hole, to detect any signs of axions’ influence. Physicists from MIT are proposing a new experiment to detect a dark matter particle called the axion. If successful, the effort could crack one of the most perplexing unsolved mysteries in particle physics, as well as finally yield a glimpse of dark matter. Axions are hypothetical elementary particles that are thought to be among the lightest particles in the universe — about one-quintillionth the size of a proton. These ultralight particles are virtually invisible, yet if they exist, axions and other yet-unobserved particles may make up 80 percent of the material in the universe, in the form of dark matter. In a paper published online in Physical Review Letters, the MIT team proposes an experiment to detect axions by simulating an extreme astrophysical phenomenon known as a magnetar — a type of neutron star that generates an immensely powerful magnetic field. The physicists reasoned that in the presence of an axion such a huge magnetic field should waver ever so slightly, producing a second, vastly smaller magnetic field as a signature of the axion itself. The team consists of MIT associate professor of physics and researcher at the Laboratory for Nuclear Science Jesse Thaler, MIT Pappalardo Fellow Benjamin Safdi, and Yonatan Kahn PhD ’15, now a postdoc at Princeton University. Together, they designed an experiment to recreate the physics of a magnetar in a controlled laboratory environment, using technology borrowed from magnetic resonance imaging (MRI). 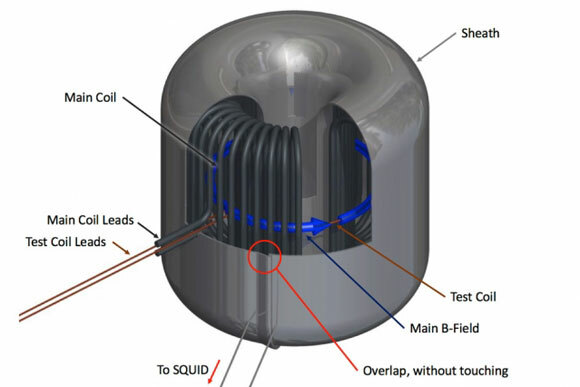 The core of the experiment, which they’ve named ABRACADABRA (A Broadband/Resonant Approach to Cosmic Axion Detection with an Amplifying B-field Ring Apparatus), consists of a series of magnetic coils, wound in the shape of a toroid, or donut, which is then encased in a layer of superconducting metal and kept in a refrigerator at temperatures just above absolute zero, to minimize external noise. The scientists plan to use a highly sensitive magnetometer, placed inside the donut hole, to detect any signs of axions’ influence. A sketch of the ABRACADABRA toroidal magnet. A constant magnetic field circulating around the toroid can interact with axion dark matter to produce a small oscillating magnetic flux through the center. In the absence of axion dark matter, this flux would be zero. If they are detected, axions may also explain an outstanding dilemma in particle physics, known as the Strong CP (charge parity) problem: Since the 1970s, scientists have grown increasingly puzzled over what Safdi describes as “the indifference of neutrons to electric fields.” Neutrons are elementary particles that are found in the nucleus of almost every atom in matter, and they do not carry a net charge. Scientists have hypothesized that this bizarre effect may be explained by the axion, which would somehow remove a neutron’s electric dipole moment. If so, the axion would modify electric and magnetic phenomena in a way that could be detectable experimentally. “It’s very tantalizing to say there might be a particle that serves this deep purpose, and even more so if we were to detect the presence of these particles in the form of dark matter,” Thaler says. Currently, Thaler says most axion hunting has been carried out by researchers at the University of Washington who are running the Axion Dark Matter Experiment, or ADMX. The experiment uses a resonant microwave cavity, set within a large superconducting magnet, to detect very weak conversions of axions to microwave photons. The experiment is tuned to look for axions within a specific range of around one quadrillionth the mass of a proton. Thaler and his team realized that they could extend this range, and look for much smaller, lighter particles, on the order of one quintillionth the mass of a proton, by recreating the physics of magnetars, in the lab. The team’s prototype design is surprisingly small — “about the palm of your hand,” Safdi says. The researchers, who are theoretical physicists by training, are now working with experimentalists at MIT to build the prototype, which is designed to generate a baseline magnetic field of about 1 tesla, comparable to current MRI machines. If axions are present, that field should waver slightly, producing a very tiny oscillation at a frequency that is directly related to the axion’s mass. Using a high-precision magnetometer, Thaler hopes to pick up that frequency and ultimately use it to identify the axion’s size. This research was supported, in part, by the U.S. Department of Energy and the Alfred P. Sloan Foundation. 8 Comments on "MIT Physicists Simulate a Magnetar to Seek Dark Matter Particle"
Total pseudo-science. Invent a particle then con the Alfred P. Sloan Inst and the U.S. Department of Energy into funding these outrageous welfare queens in white coats. The strongest magnetic field ever produced in a laboratory in the world was 91.4 teslas. A magnetar produces a magnetic field of 10 to 10th power Tesla (10^10) which is 8 orders of magnitude stronger and you can honestly tell me that this isn’t a scam perpetrated by welfare queens in white coats on the Alfred P. Sloan Foundation and upon the U.S. Department of Energy? Plus… to the moderator… if you delete my comments then you’re just as dishonest as those scientists. Everyone seems to be afraid to call out these frauds for what they really are. Why is that? Is it because they have M.I.T. by their names or because that’s where they work? Plus Buck, what’s is this “proton” they’re talking about? If I can’t see it must not exist. I’ll make a prediction – Dark Matter Particle will not be found. Bucky, it must be daunting that literally everything and everyone is confusing to you. Especially those sissy white coat welfare queens. Perhaps the Sesame Street website is a better fit for you. I think Buck was bullied by scientists as a child.